Are Your Cleaners Quick on the Draw? When it comes to properly equipping your cleaning staff, sometimes it’s hard to know what products to buy, tools they need or how the products should be used. Each organization will have their own challenges when it comes to properly maintaining and cleaning the facility. However, Betco has simplified the process for you with an innovative and versatile system. When cleaning chemicals are not accurately diluted, it’s like pouring money down the drain. Stop the leak and potential danger with the Betco FastDraw System. This unique system has a one size fits all bottle design which is easy to use and reduces your inventory. In addition, there are metering inserts in each FastDraw bottle. These inserts save you money by maintaining accurate dilution each time and eliminating maintenance. Betco ensures cleaning consistency by using colour coded bottles, liquid and labels. This makes it easy to train your staff on proper chemical selection. The FastDraw system also includes wall charts and task cards with icons and graphics, making it easy to follow. These charts and cards can be customized for your unique facility and are available in English, Spanish and French. The spill proof design eliminates the potential risk of cleaning staff coming into contact with any chemicals. 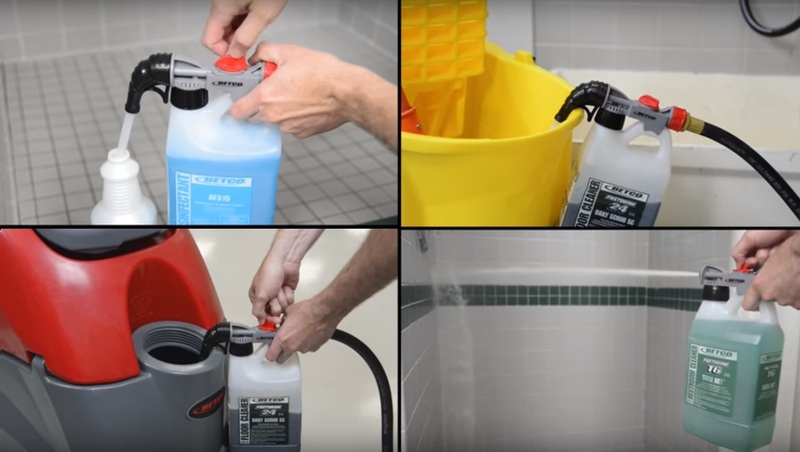 Users will no longer have to play the guessing game when filling spray bottles and mop buckets as this system uses intuitive icons to show exactly how much to use. The Betco FastDraw System accommodates over 30 products, including Green Earth. And, keeping the environment in mind, FastDraw reduces the carbon footprint by decreasing chemical and plastic in the waste stream. In fact, one concentrated bottle of product can replace up to 544 ready-to-use quarts! Consider that green and saving you green! In fact, Betco’s FastDraw can reduce cleaning costs up to 30% simply by having an accurate dispensing method for diluting solutions. This system is ideal for small or large areas with multiple cleaning requirements. Whether it’s the FastDraw1, FastDraw Freedom or FastDraw Pro, there is a system that’s perfect for you. We are happy to help you find the solution that works best for you. Contact us today to discover more about the FastDraw system and how it can improve your efficiency and your bottom line. A blog dedicated to all things clean. Copyright © 2017 Checkers Cleaning Supply.